Oscar Robertson’s records at Indianapolis (Crispus Attucks High School), University of Cincinnati and throughout his professional career are nothing short of impressive. Red Auerbach rates Oscar as “the best, most versatile player he has ever seen”. The Big O could do it all. He could score from any spot on the floor. He was unstoppable. He set records for assists and rebounds as well as scoring and scoring average. The Big O played 14 years as a professional. His teams won championships at every level: state, college, Olympics and professionally. Listed are some of his high school recognitions and records: All-State (1955 and 1956); Indiana’s Mr. Basketball; led Crispus Attucks High School to schools first State Championship; led Crispus Attucks to 45 straight wins; scored 62 points in a game as a senior. Some of Oscar’s college records include: Sporting News College Player of the Year (1958, 1959 and 1960); Look Magazine All-American (1958); led the nation in scoring in 1958 (35.1 points per game), 1959 (32.6 points per game) and 1960 (33.7); led University of Cincinnati in 1959 and 1960 to finals of the NCAA championships; led UC to 79-9 record; became UC’s first All-American basketball player and All-American athlete (1968); UC retired his #12 jersey. 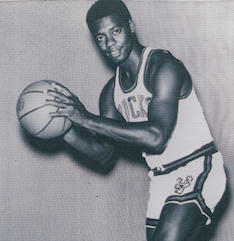 Oscar Robertson was co-captain of the 1960 Olympic team which won the Gold Medal. Oscar’s most notable professional feats are: In 1961-62 Oscar averaged a triple-double for the entire season, averaging 30.6 points per game, 11.4 assists per game, 12.5 rebounds per game a feat that has never been duplicated; he was an NBA All-Star 11 times and led the Royals and Bucks to 10 play-off births. In 1971 Oscar teamed with Kareem Abdul-Jabbar to land Milwaukee its only NBA Title. Oscar concluded his career with 26,710 points (25.7 per game), 9,887 assists (9.5 per game), 7,804 rebounds (25 per game). Big O is the NBA all time leader in career assists and free throws made. He was enshrined in the Naismith Memorial Hall of Fame in 1980.